In all the busyness of the last couple of weeks, I completely missed a huge milestone in my blog. I can’t believe it but Monday was my 300th post! I can’t believe I have shared that many things with my readers. I also can’t believe I have been blogging for three years now. I have thoroughly enjoyed chronicling my kitchen and life adventures through this blog and hope to continue to share for a long time to come. I decided to share this recipe with you again because 1) it is delicious, 2) I was looking for the recipe on my own blog the other day while grocery shopping and couldn’t find it, and 3) I think it makes a great lunch. Unless you are the type who can eat bologna every day, we are all looking for variety in our lunches. 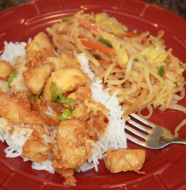 So I first blogged about this recipe in my first year of blogging, but it was under the title of chicken, chicken, and more chicken. In the post, I talked about cooking a whole chicken and then using it for several different recipes. I still like to cook a chicken (or multiple chickens), and then shred them and then freeze the shredded chicken to have on hand for easy weeknight meals. I actually did this just last week. I must confess that having cooked chicken in my freezer is a lifesaver on busy days. Just last week, I was able to pull together a delicious white chili in the matter of minutes thanks to having chicken on hand. 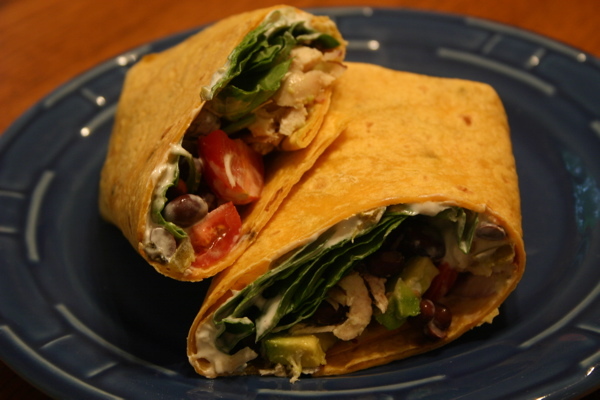 These wraps are another great way to use cooked chicken. The flavor combination is excellent and sometimes you just need something besides a sandwich in your lunch. This wrap tastes fresh and is a great change of pace. I hope you enjoy them as much as we do. I should also mention that they aren’t just for lunch: they also make a great dinner. 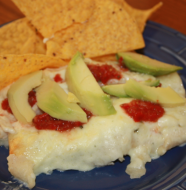 Just serve along with some salsa, guacamole, chips, and fruit and you have a great meal. In a small bowl, combine sour cream, jalapenos, and lime juice. Season with salt and pepper to taste. In the center of the wrap spread a couple of tablespoons of the sour cream mixture. Top with a handful of spinach, chicken, black beans, tomato, onion, and avocado. To fold, turn two of the sides in towards the center folding them over the filling then roll up ending with the seam side down. Cut in half and enjoy. I like to serve mine with tortilla chips and salsa. 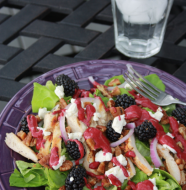 Add a fruit salad to round out the meal. One Comment on "Southwest Chicken Wraps"